Composition and properties of the soil directly influence the successful growth of any plant. 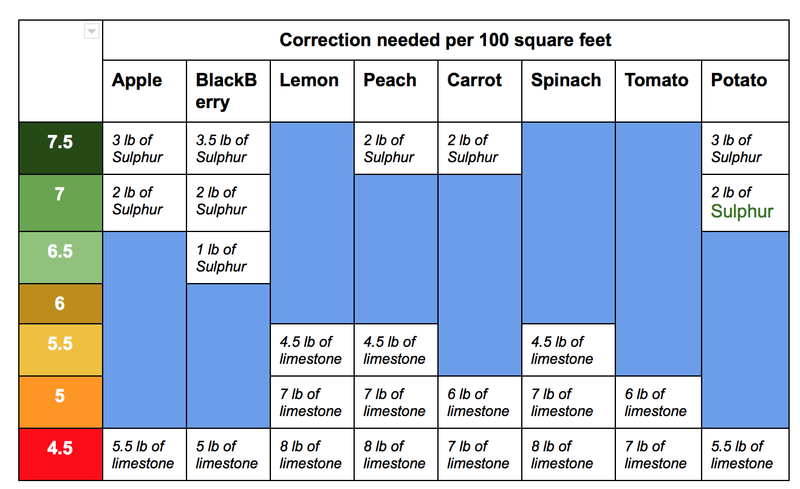 Different plants need different soil conditions. In high scale commercial farming, experts measure and maintain the the quality of the soil to get better results. Even at the domestic level, gardeners and farming hobbyists have the ability to measure the properties of their garden or backyard easily, thanks to the simple soil test kits. These kits are easy and simple enough to use without any expert knowledge and pretty accurate given the small scale used. In spite of the easy operation, I felt some people may find it difficult to relate the results of these tests to what they want to plant. Simply- “ I got dark green for my pH test and I want to plant an apple tree. What should I do?” Therefore in my project I propose a way of simply representing these information in a tabular form. As a part of this information base I created the following table to be used with the Rapitest ph test kit as an example. Not everyone is fortunate enough to be financially able to hire a gardener or arborist to maintain the natural environment on their property. Property owners are often challenged to identify and address the needs of the natural environment they choose to keep. This often leads to erroneous or incompatible soil fertilization and watering schedules for each plant respectively. Applying the incorrect amount of fertilizer can “burn” or “starve” a tree. While applying fertilizer indirectly can lead to incomplete fertilization and starvation of a tree’s nutritional requirements. Although I have personal experience fertilizing crops, I am still often sloppy and incomplete in my application. I recently fertilized my palm trees in my yard and realized how indirect some of my application was. One side of the tree had the gravel pushed back and the roots were exposed to the application, whereas the opposite side did not have the rocks or debris cleared and the application was void of fertilizer. After a complete watering for several days, the fertilizer should now show increases in the proposed mineral composition of the”Lilly Miller” fertilizer product when sampling soil taken from beneath the surface. Although the fertilizer will have an effect on the unapplied side of the tree, the dispersion of the chemicals takes additional time and considerable soil soaking. A 15 minute daily drip watering has occurred 3 times, without a full soaking or rainfall. Watering has also been concentrated towards the cleared and fertilized side, likely enhancing the effectiveness of the concentrated application. The 10-5-8 reference on the packaging is intended to suggest a 10%N(Nitrogen), 5% P2O5(Phosphate), 8% K2O(Potash) composition makeup. 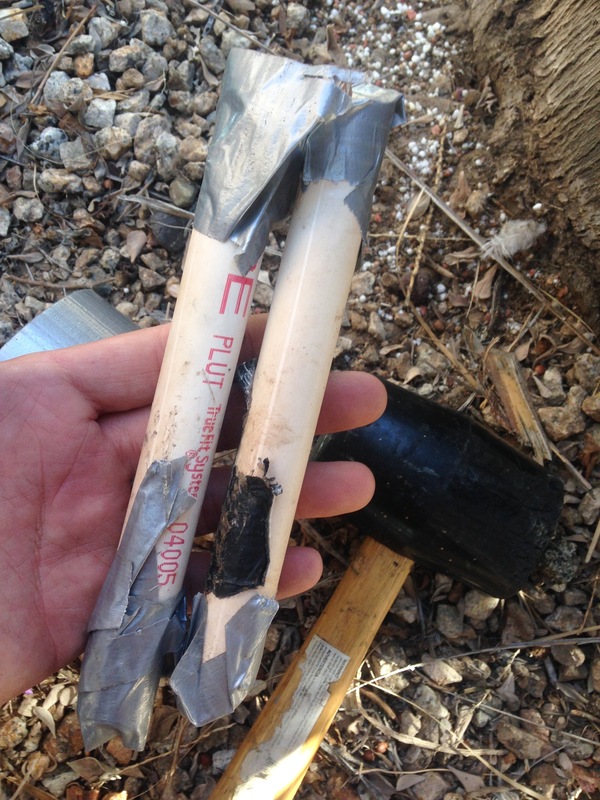 Soil was sampled using a 1.5″ pvc tube hammered into the ground, sampling 3-6 inches in depth from each side of the tree. Hypothetically, the available Nitrogen, Phosphate and Potash will show significantly higher values on the directly applied side of the tree than that of the un-applied side. In effect, the outcome of my hypothesis requires a full soil test to determine the values and differences/similarities in the available N, P2O5 and K2O. 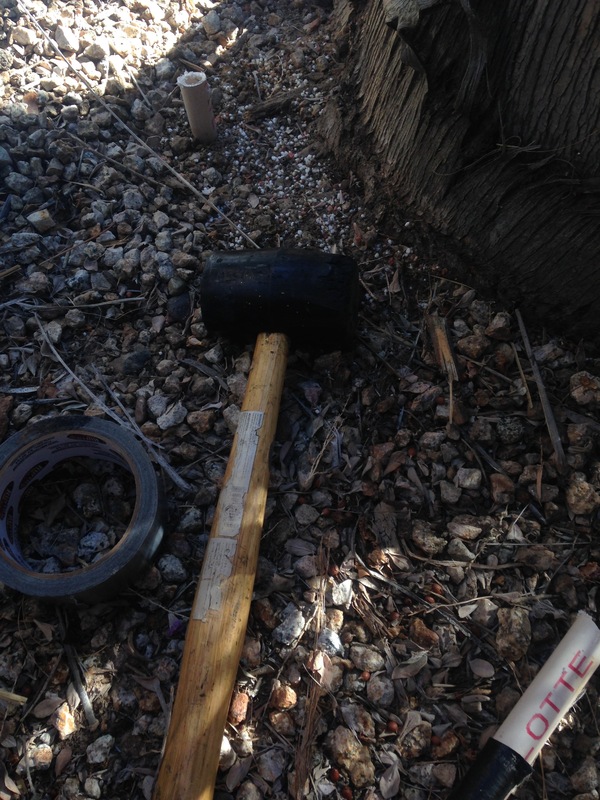 Additional tests of various chemicals and values may reveal additional findings of interest. These findings would be of value to gardeners or professionals interested in maintaining healthy foliage through proper fertilizer application and distribution. For my project, I wanted to create a way for people to explore and understand different types of soil and what types of plants grow in them. To do this, I designed a terraced terrarium, which would contain different types of soil and plants on the different terraces. 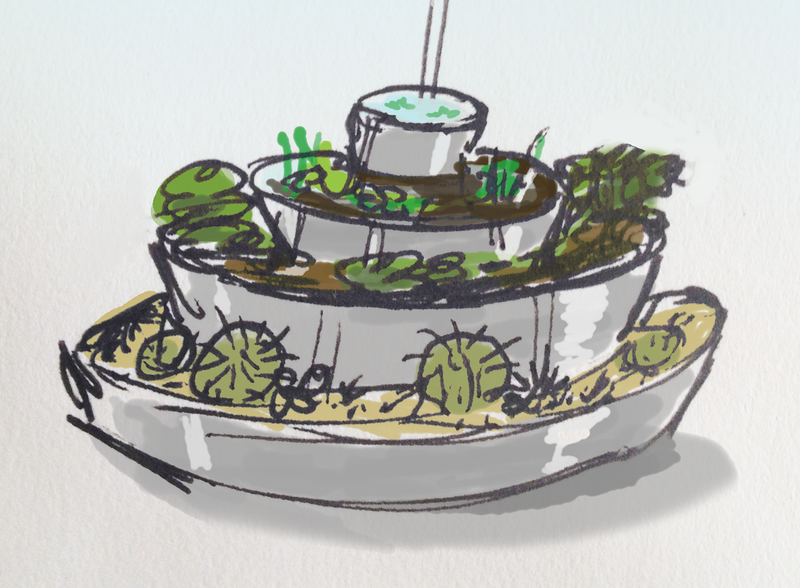 Sketch of Terrace Terrarium – in this version, the terraces are divided by the dryness of climate (1st being full water, 2nd swampland, 3rd rocky soil, 4th sand). Theoretically, people could try only watering the top and then using overflow to water the rest of the terraces based on how much water trickles down, but that could end disastrously. 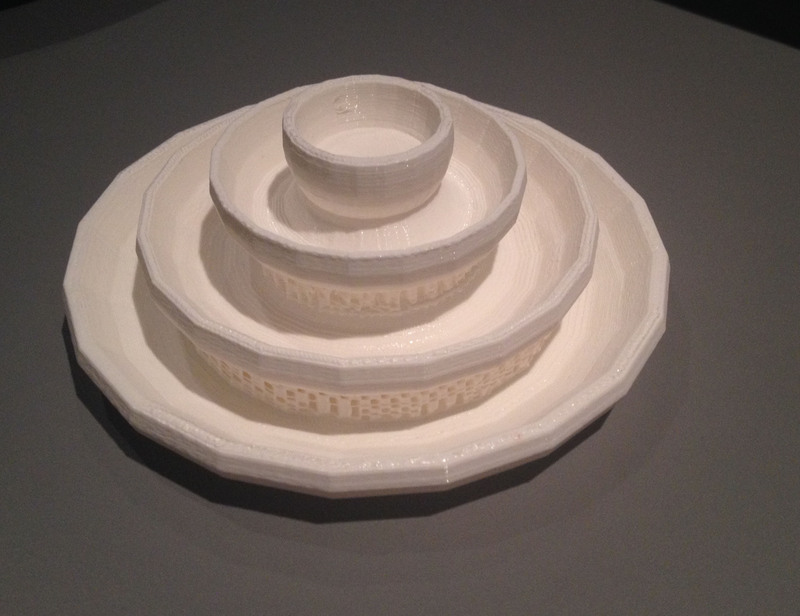 Printed Model – even for tiny plants, the final version would need to be larger than this model, and would have to be watertight. This piece could help to demonstrate how different soil and water combinations can be beneficial to different types of plants, even when they are exposed to similar temperatures and amounts of sunlight. How can citizens engage with soil quality? What kind of system would support this engagement and how would it be evaluated? This is a maker assignment, so you must physically make at least some part of the system you envision. The tangible artifact you create could be high-tech or low tech. For instance, if your system concept is a toy for kids that measures soil pH, you might prototype the actual sensor or the physical form it might take on; if your system is a gift economy where people send each other plants grown in their home soil, you might prototype a container or an image capture application that shares the results. Post your assignment under the “soilsystem” category.